This Pecto 1 is one of a small series of cameras produced by the English manufacturer, Columbia Optical Co.. 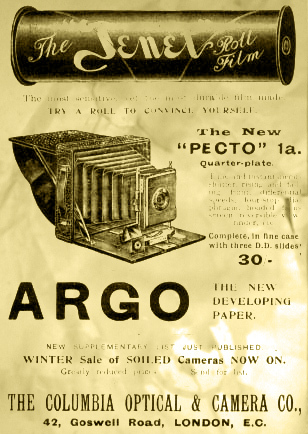 They were producing cameras at least as early as 1897 and were based in London. The Pecto 5, which crops up on occasion, was a hand or stand camera fitted with the then common Bausch and Lomb pneumatic shutter. This Pecto 1 is a lesser camera aimed at the amateur. To this end it has very limited shutter speeds, just Instant, roughly 1/40th sec or timed. The shutter is a home produced item, entirely built into the lensboard, which forms the shutter box. Initially the shutter looks very similar in operation to the millions of "over centre" shutters fitted to cheap Box cameras. This is not the case, as the Pecto 1 shutter is not self energizing, a spring is tensioned with a downwards sweep of the lowest lever, and then released with either of the two top ones, marked "T" or "I". It's possible the "over Centre" type was patented elsewhere so Columbia concocted their own, in operation the main lever releases under spring tension and simply "thwacks" the shutter blade out of the way briefly, before it returns by it's own spring. The aperture is controlled by three "waterhouse "stops, via a slot in the top of the lensboard/shutter box. The low quality two element achromatic lens has a usable aperture of f/18 and the smallest stop is f/38. This Pecto 1 was donated to the LICM in January 2009, by Ben Lyons and arrived in sound but worn condition. It was subjected to a deep clean and restoration process throughout February and March 2009. During this process, evidence of the cheapness was most clearly demonstrated! The build quality throughout is poor, in fact, it appears it may have been built by someone inexperienced. There are a number of occasions where the screw holes have been repositioned. In one case the carcass had been split, as the hole was too close to the edge. The camera spent it's entire working life with the lens bed too high, which would have resulted in distorted images and poor focus, not to mention preventing the hatch from closing fully, resulting in a warped hatch. The opportunity to redress this was taken during rebuild, but the warped hatch was left as it was. The plate carriers feature vulcanite dark slides, these have warped beyond use as Columbia decided that sprung steel light dams would be sufficient. Accordingly the worst of the plate carriers was rebuilt with felt dams to make it usable. At right is a contemporary advert, sadly date unknown, for a Pecto 1A, also Quarter Plate and very similar. It does however show a strutted viewing hood, shade for the waist level finder, rise and fall and possibly a double strutted lens bed, so must either be a development or a parallel higher specification model. Either way, it appears that Goswell Road was redeveloped by the Luftwaffe 40 odd years later, by which time Columbia Optical Co. had apparently been relegated to the history books. Body No. 169, written in pencil at the top of focal back.